The Common Yew or English Yew (Taxus baccata) is one of our few truly native, British trees and is ideal to have in your garden if you have nothing to do on a weekend and fancy making bows and arrows (Historically commonly Yewsed...see what we did there?...ok not funny if we have to explain it). Quite a feature of the landscape, this is a slow-growing, evergreen tree. 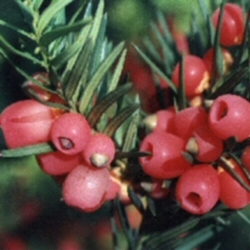 Attractive red-berries are produced in summer but remember that they are poisonous (If your partner offers you a Yew berry sandwich, that might be a hint your relationship is in trouble). Taxus Baccata is quite a tolerant tree of most conditions however wet conditions will certainly annoy it causing it to under perform. So Chalky, dry or clay conditions are ok for the Common Yew tree. Suited to small-medium gardens as it will only reach a height of 6 metres after 10 years. It also well-suited to trimming and looks good for Topiary. Our Common Yew trees are supplied at a height of 80-150 cm in a 5-15 litre container for year round planting and better results than from bare-root or rootballed stock.